Damn the quirky soul mates who set up at the flea market this weekend with eccentric treasures. I had strict rules to not buy smalls so I stuck to my guns! Just kidding. I spent until my cash was all gone and got their numbers so I can buy more later. Ha! I haven't been this excited about a haul in a while! Sometimes you just have to go with the toys your sinful inner child is screaming for. As always, everything pictured is for sale, e-mail me if you'd like anything. I will enjoy each item sitting around at home or my shops until they sell! Each one of these quirky pins is solid gold. Not a dud among them, I'd be proud to rock any of these. I'll be packaging these for Southern Crossing today. The antique texture of the brass lamp is delicious! You know you'd love that providing wonderful task lighting on your desk as you work. 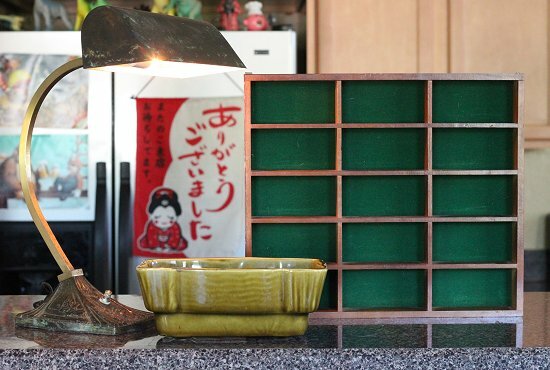 I like the green of the vintage planter and in the backdrop of the shadowbox, too. 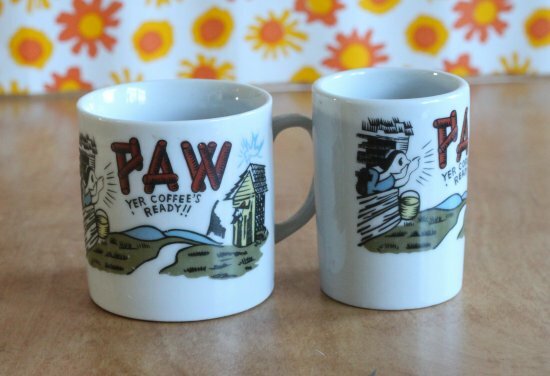 These two coffee mugs remind of classic era comic books from the 1930s. Gorgeous color scheme on these. The "Paw" written with rustic logs? The awesome! It explodes, I tell you. 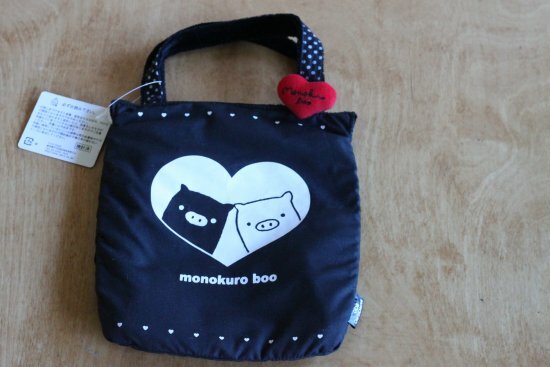 A lucky yard sale find with the tag on is this cute Sanrio Monokuro Boo bag. It can be worn four different ways! 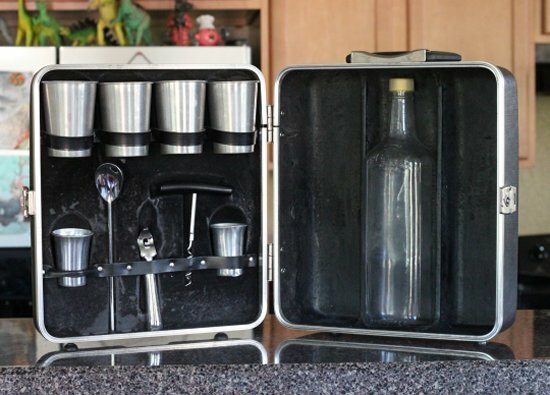 Edit: I forgot to show off the second vintage Mad Men era 1960s Executair 101 portable bar I've found at the flea market! All the pieces are intact, a great gift for couples or swinging playboys alike! 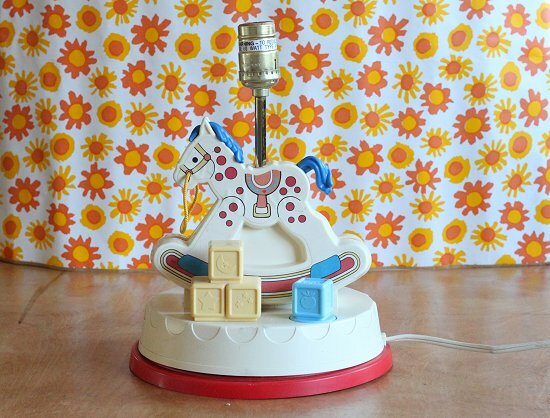 This Fisher Price horsey lamp will light up nostalgia in a collector out there, I'm sure of it. It's fully functional and plays a little midi lullaby with you twist the blue block in the front. The yellow blocks in the front have a light behind them for extra illumination. I'll have to find a shade for it, but it's cute as is. I have an entire bookshelf of books I own just because I want to scan the illustrations. I must schedule time and start that daunting task, because the collection keeps growing! 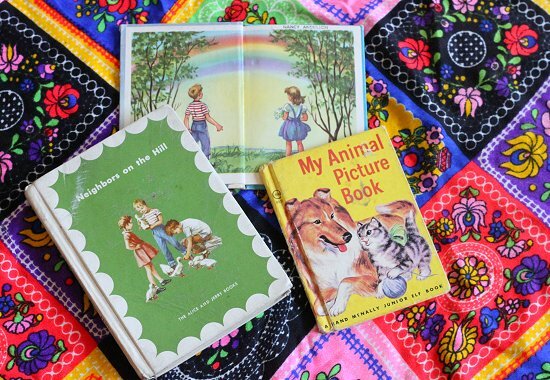 The background here is a bit of vintage fabric I bought from the same vendor as the books. The comic lover in me never resists vintage Peanuts collectibles. I think we'd actual like out bills if we had this retro tin to store them in. I'm tempted to keep both of these. Oh so tempted. 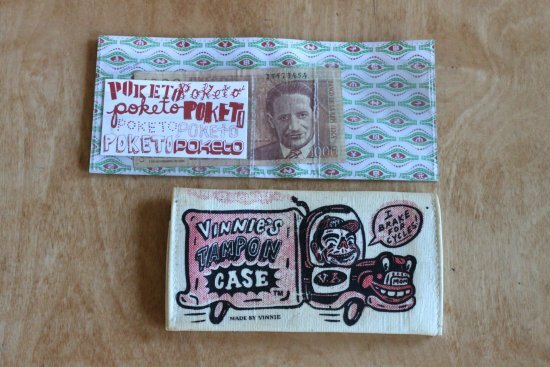 My dusty old wallet has been hanging around since High School. This the the inside of the top wallet and back of the second "Tampon Case". The design on the Poketo top wallet is drool worthy. Love the pairing of foreign currency with informative and attractive business card with information about the designer. The top wallet is super thin and designed to fit in your pocket with ease. 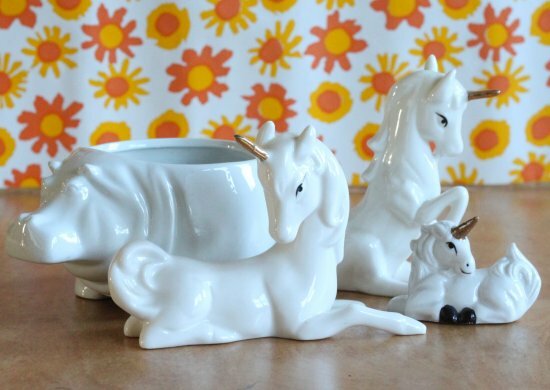 With this many dainty white unicorns found in one weekend I am the King of Kitsch! Unicorns usually sell well for me so I scooped up each one. All of these are rather small, this is an extreme close-up. 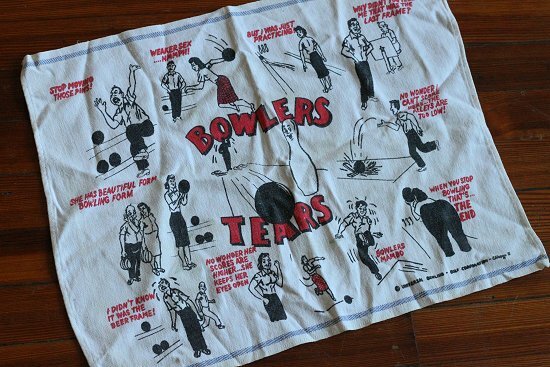 I love the whimsical art and bold typography of this fun tea towel. Fun to display in a Man Cave or kitchen. 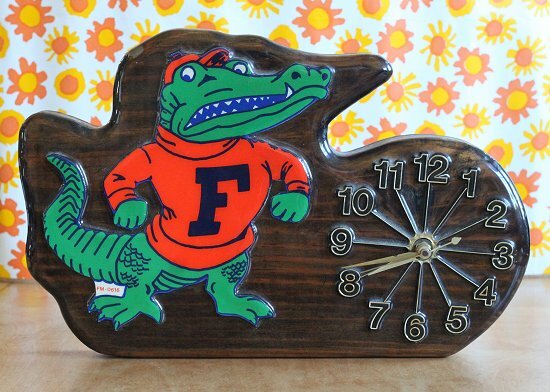 I found this Florida Gators clock at a Goodwill pound store. There are rabid fans for this North Florida football team all around me in North Florida so I'm sure it will sell quickly. I usually hate Football merchandise but this one is truly a thing of beauty. 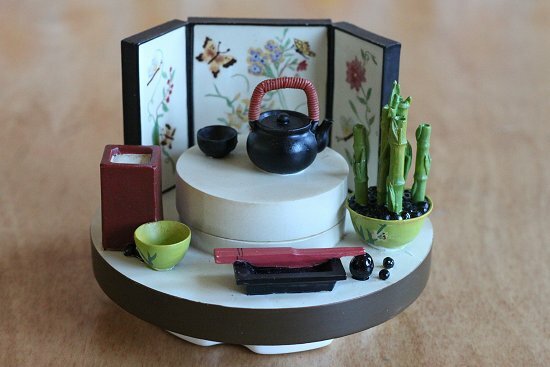 And a favorite find I will proud to display in the "tea" corner of my kitchen is this tiny Japanese still life. I'm not sure the use, it appears to be some type of small votive. It's quite detailed for 4.5 inches wide and 3.5 inches tall! And now I'm off again to clean, package, and price 1 million things and then clean my poor destroyed home. I have furniture and clothing finds to show off later in the week. I've a busy thrifter! I can't possibly keep it all! 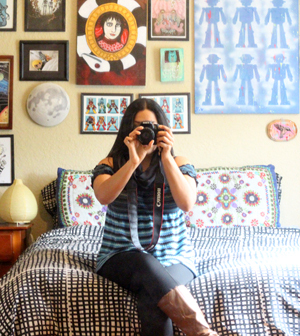 Everything in my thrift haul posts is FOR SALE. E-mail me if you're interested in anything you see! I also host daily deals this blog (the haul post prices are lower than normal) and on Facebook and Twitter. After reading about your great flea market finds, I decided to take the plunge myself. Ick. Maybe flea markets here aren't the same as yours, but there was almost nothing but cheap Chinese-made crap. The only stall of vintage merchandise that interested me was so overpriced I couldn't believe it. A cute ceramic owl that I'd pay $3 or $4 in the thrift store was $25. Maybe I'll venture further out to some of the other flea markets in the area, but for now I'm sticking to my favorite thrift stores. My husband talked me out of buying that same hippo planter. Damn him! Mmmm, that lamp is amazing! I love the hippo planter, too. Great scores all around! Thank ya :D I sold a yellow hippo planter like him, so had to pick up his ivory doppleganger. 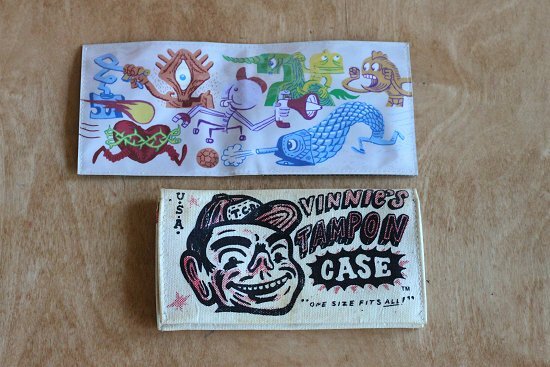 *I'd be tempted to keep the wallet and tampon case too.They are super cool! *Sometimes those Playmobil figures can go for a nice chunk of change on Ebay. *That lamp would look so cute with a red polka dot shade. *Does the hippo feel sad because it doesn't have a shiny gold horn? 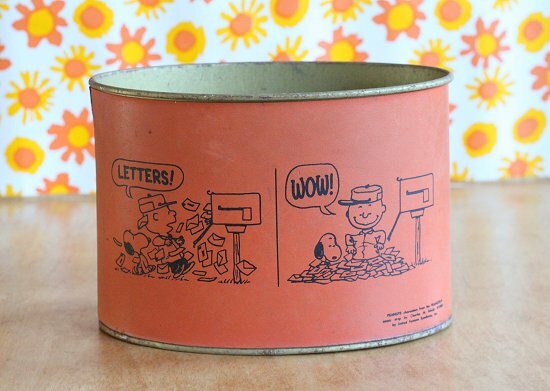 *In love with the Peanuts tin.Would look so cute as a fall centerpiece with a mum in it. I've heard of that on the Playmobil figures, I'll have to look them up. I love the primary colors, shapes, and the fact that they're pirates and an Indian. Little boy fantasy staples. I'm nerdishly excited that my BF said he's bringing me a mum plant today. I should stick it in the Peanuts tin, great suggestion! I found a similar travel bar and it sold on the first day I set up my antique booth. Now I will always be looking for them. Love your pins too - how do you display them in your booth? In short, I always change my displays to see which way sells them best. And people see the items in a new way when it's displayed differently every time and make a purchase they wouldn't have before. Awesome haul Van you went a little crazy, but there is certainly some awesome desirable pieces amongst those pics that have me twitching with a little excitement. You should take some pics. ;) Those things are irresistible. seriously good haul, van! wow! 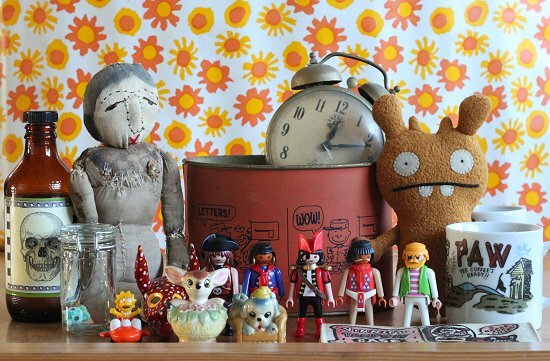 i love the old clock and the grey rag doll too (she looks like she's stepped out of a horror movie.) i think the peanuts tin and the tampon case are my faves - that tampon case is hysterical! I should have taken a close up of the gray rag doll, she's an amazing creepy voodoo doll. Must do a follow-up on October along with other spooky bits I've found. Excellent haul. I love vintage bowling stuff.. picked up a couple vintage bowling shot (?) glasses this weekend.. still have to post. I love bowling anything...gotta check out your shot glasses! Those unicorns! I saw them at Savers last week, but 2.99 each? Nah...Still there when I went back last night. Well, dang. Now I want them. Holy crap! So much awesome stuff! We might have to talk about that hippos planter, he's wonderful! He's still here, send me an e-mail if you're interested :) I was selling him for $8.00. So much teeny, tiny cuteness! Van, what is that near the skull bottle? Is that a little old lady doll!? Ah this is a fun haul, indeed. The vendor called it a voodoo doll. It's more likely an ancient old lady doll, all stitched-together horror movie style with stuffing coming out everywhere. It's creepy and fun! ncredible work & Fabulous photo shoot!Hopefully,You will reach the top of the level. We want to work with legends like you.